The French days of the week do NOT start with a capital letter as in English. Notice how the “work” days of the week all end in di. En France, le premier jour de la semaine est le lundi. Samedi et dimanche = le weekend (yes, it’s borrowed from English). It is sometimes written as le week-end which is also considered correct. You may see the official la fin de semaine but you will almost never hear it outside of Quebec. You will notice that the abbreviation of each is just its first three letters. Quel jour est-il (aujourd’hui)? – What day is it (today)? Il est … mercredi. – Today is … Wednesday. You may hear the question: Quel jour sommes-nous? With the response being: Nous sommes mercredi. You may also hear the question: Quel jour est-ce? With the response being: C’est mercredi. You may also hear the question: Quel jour est-on? 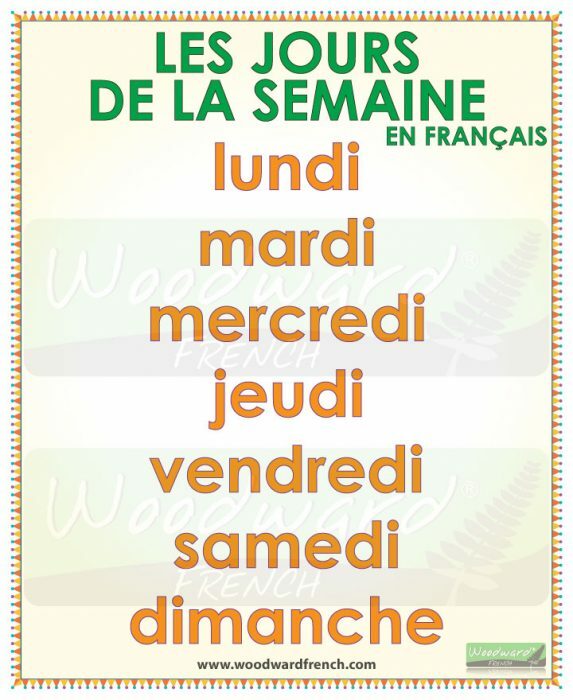 NOTE: All of the days of the week in French are masculine.